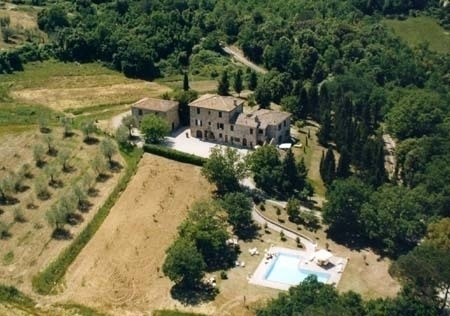 Our property is situated 23 Km from Siena and 3 km away from the villages of Vescovado and Murlo. 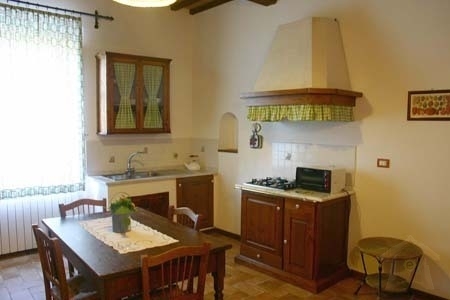 All apartments have been sympathetically redesigned and decorated with elegance in typical Tuscan country style. 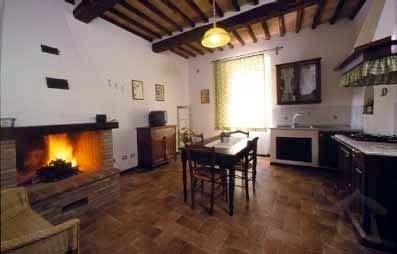 I Pianelli is a typical Tuscan farmhouse divided in 6 very cozy apartments. 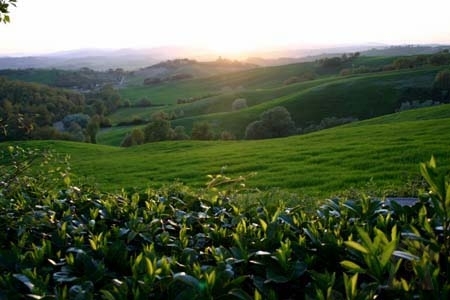 Our farm I Pianelli is situated in this quiet and silent countryside where only old villages and farms are visible. Gentle plains elongating beneath a certainly not ending flight of hills, amid intricate vegetation scattered with olive trees, wineries, lonely cypresses and thick forest. 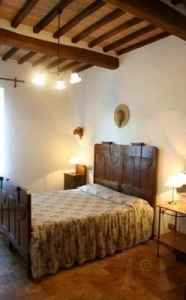 Once the home of peasant families, now it is a farmhouse whose apartments are appointed according to the original Tuscan country style and are well equipped with central heating, TV and a safe. On the farm you can play table tennis, bar billiards, football or go for nice walks. There is a swimming pool and a small playground for children. A Wifi Internet connection is presented also. 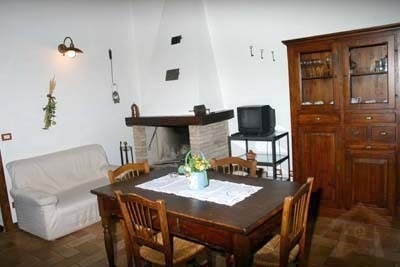 The charming apartment I Pianelli is located on the first floor and is made up of a kitchen and dining room with sitting area, fireplace and dishwasher, a double bedroom with a double bed, a double bedroom with twin beds, a bathroom with shower. Thank to its easy location you can easily reach places of extraordinary creative and cultural interest like medieval towns and villages, castles, abbeys and parish churches. 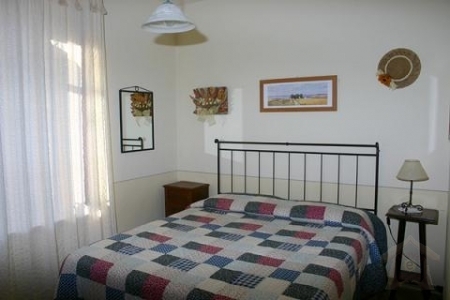 The farmhouse has been sympathetically refurbished and still maintains its ancient stone structure. From 450 to 840 Euros per week, according to season. Bed linen and bath towels ar eincluded, with a weekly change. Supplement for heating, according to season. All other costs included in the rate. 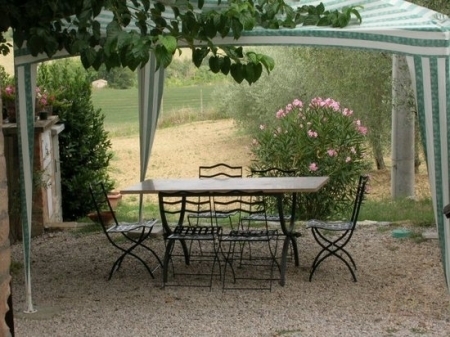 The Tuscany area is a charming land, blessed by the genius of man and nature. With its magnificent hilly landscapes spreading up from the mountains to the seaside and its historical and archaeological sites, it is one of Italyâ��s most famous regions. 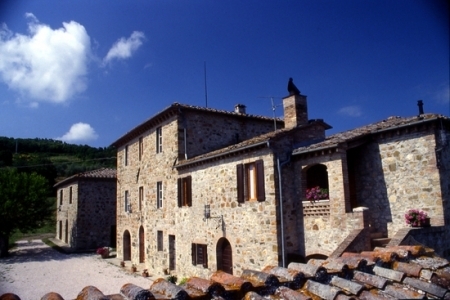 There is also a secret side of Tuscany that includes plenty of medieval hamlets and castles perched on hill-tops or dug out of rocky cliffs that were once the stage for harsh conflicts between local landlords. Each spot is a gem in its own right, not only for the countryside but also for the knowledge of the history of the land and the people living there. It can also represent a wonderful haven if you are looking for a place to unwind. Our farmouse I Pianelli is conveniently located. Some of the most famous sightseeing spots in Tuscany are very closeby: Siena (25â�� drive), Florence and Arezzo (1hr drive), San Gimignano, Pienza, Montalcino and Montepulciano (about 40â�� drive). A lot of famous sites in the southern Tuscany, including the beautiful white sandy beaches of Maremma, the Natural Park of Uccellina, the Mount Amiata and the Elba Island, can be easily reached from I Pianelli. We will be glad to provide our guests with some useful information about the tourist areas they are interested in. 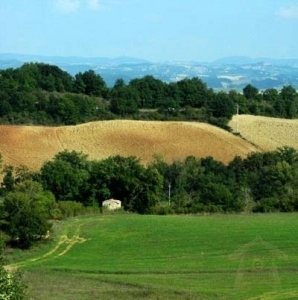 The woody area around I Pianelli offers a wide range of paths and hiking tracks leading to beautiful, unspoilt spots like the nearby Crevole castle or the very scenic natural area south west of Murlo. Following the stream Crevole through the picturesque hamlet of Miniere di Murlo, you can get further south towards La Befa, entering the Natural Reserve of the Val di Merse, named after the stream Merse that flows through it. We will be happy to provide our guests with detailed information about the most interesting hiking tracks in the surrounding area. The people of the Val di Merse have always tried to protect from foreign invasion the thousands of acres of forests, the gently rolling hills, the thickets of holm-oaks, the chestnuts, the pines, the laurel, the berries, the oaks, the hornbeam, creepers and brambles which cascade into the white river Merse, and which continue to reproduce day after day and are a special feature of this valley. It is the river. which throughout its history, has fed many mills, and which seems to exist only to promote the flora which naturalists define as \"extraordinary \" or to encourage the increase of fauna, which even strangers to this area are amazed to find, and greatly admire. I Pianelli is situated at the edge of the Sienese Clay Hills (Crete Senesi) Without doubt the Sienese clay hills create one of the most fascinating landscapes in Tuscany with their original scenery and splendid historical and architectural heritage. Starting from Siena and reaching the heart of the Crete, the landscape unfolds between a stretch of clayey hills almost completely bare of tall vegetation, cut through here and there by deep erosion furrows. Their main chromatic note of grey takes on diverse shades and reflections with the passing of the hours and seasons. Mediaeval fortified villages, ancient farming complexes, parish churches and fortresses appear unexpectedly, fascinating signs of local history and man\'s noble endeavours. More splendid scenery is offered along the route taken to reach Asciano; here the Crete do not look quite so wild and may be covered by sunflowers in summer and green pastures or corn fields springtime. Asciano, with its Etruscan and Roman origins, has maintained its mediaeval appearance, enclosed as it is by its XIV century walls. The whole area is ideal for biking and hiking. The nearby walled village of Murlo includes a very nice Etruscan Museum called â��Antiquarium of Poggio Civitate\" because it displays materials found in the important nearby Etruscan site of \"Poggio Civitate\". The decision of exhibiting materials found near the Etruscan site was taken in the Seventies and brought about the inauguration of the Museum in 1988. An extension was built onto the same Museum in 2002, the so-called \"Palazzina\", an adjacent building where new finds could be exhibited. The materials and finds exhibited in the Antiquarium of Poggio Civitate come mostly from a princely Etruscan residence dating back to a period between the VIIÂ° and the VÂ° century BC. This makes a peculiar difference since most of other Etruscan museums mainly show objects coming from tombs. The finds include sculptures and terracotta reliefs as well as daily tools and domestic objects either in ceramic, terracotta, bucchero, bone or ivory. All of them provide precious information on the habits, the contacts and trades of such a sophisticated ancient civilization. Some of the Museumâ��s objects are just unique, like the well known princely residenceâ��s roof and the recently added workshopâ��s roof, the horse race and the Banquetâ��s terracotta reliefs (sime), or the acrotÃ¨re called \"Cappellone (big hat)\" for the peculiar shape of the hat, which has become Murloâ��s trademark. 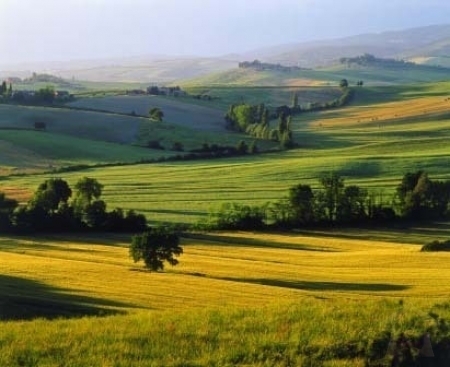 The particularly favorable setting of I Pianelli allows for a combination of countryside quietness and various possibilities for local excursions to places of natural beauty and of cultural relevance, such as Siena, San Gimignano, Florence, Pienza, Montalcino, Montepulciano. Coming from the A1 Milan-Rome, when you reach Florence take the exit â��Firenze Imprunetaâ�� and proceed on the motorway to Siena. After reaching Siena, carry on straight ahead direction Grosseto. Go straight on for about 14 km until you come across the sign for â��Fontazziâ�� on the left side of the road. Bear left watching the signs for Vescovado and Murlo and passing the small settlements Fontazzi and Palazzina. Be careful not to take either right towards Casciano or left towards Radi. After 9 km past Fontazzi and 3 km before reaching Vescovado you come across a sign on the right side of the road, that points â��I Pianelliâ��. Wenn you reach Siena from Rome you have to leave the highway A1 in Bettolle, Sinalunga and watch out the signs for Siena. Donâ��t get into the town but carry on straight ahead direction Grosseto. Go straight on for about 14 km until you come across the sign for â��Fontazziâ�� on the left side of the main road, then follow previous instructions. 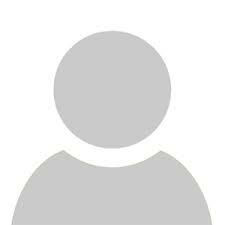 My name\'s Mario and I am one of the owners and manager of I Pianelli. 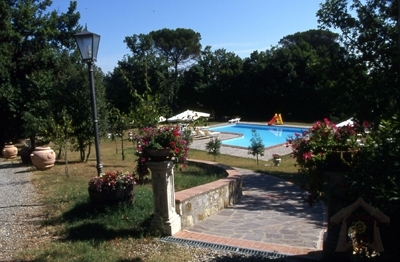 Once the home of paysant families, our villa has been lovingly renovated and converted into a holiday home. One of our purposes is to help our guests enjoy their stay in our farmhouse and discover such a unique surrounding area, so full of history and culture. We are happy to provide them with all the useful information of local amenities and sightseeing spots. Our main purpose, however, is to make our guests feel at home.